4-ply (approx. 1/16" thick) double sided super smooth black illustration board made from 100% recycled fiber. Manufactured at an alkaline pH. +/- 1/16 sizing. 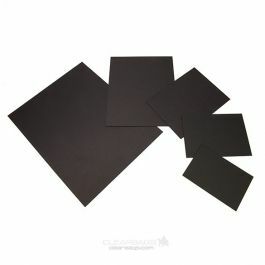 ClearBags Black Backing Board features a double-sided super smooth finish at an affordable price. pH neutral. 100% recycled content. 4-Ply=50-54 points 1/16" thick. +/- 1/16" sizing.